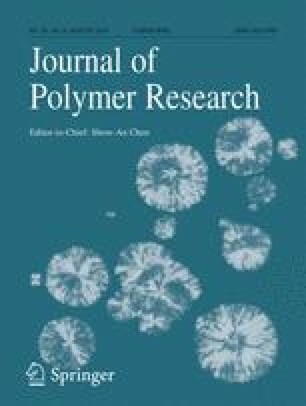 This work focuses on improve the mechanical properties of poly(lactic acid)/poly(ethylene-co-vinyl alcohol) (PLA/EVOH) blend and simultaneously remained a high Vicat softening temperature (VST) using appropriate contents of methyl methacrylate–butadiene–styrene copolymer (MBS) via simple melt blending. The effects of MBS on the heat resistant, mechanical properties, thermal properties and rheological behavior were examined in detail with various techniques. The VST of neat PLA significantly increased to 159 °C from 66.8 °C after blending with 50 wt% EVOH. However, the VST was gradually decreased with increasing MBS content but were still much higher than that of neat PLA. On the basis of the tensile and impact tests results, PLA/EVOH/MBS blends showed a considerably higher elongation at break and impact strength. For all PLA/EVOH/MBS blends, the thermal stability was increased compared than that of PLA/EVOH blend without MBS. With increasing MBS content, the complex viscosity and storage modulus of PLA/EVOH blend increased, especially at low frequencies, indicating that MBS enhanced the chain entanglement in the PLA/EVOH matrix. In addition, the results Han curves and Cole–Cole plots indicated that the relaxation time was increased when MBS was added. This work was supported by the fund of Science and Technology Bureau of Jilin Province of China (No. 20170204012SF), Chinese Science Academy (Changchun Branch) (No. 2017SYHZ0018 and No. 2017SYHZ0016), and the project National of Key Research and Development Program of China (No. 2016YFC0501402).